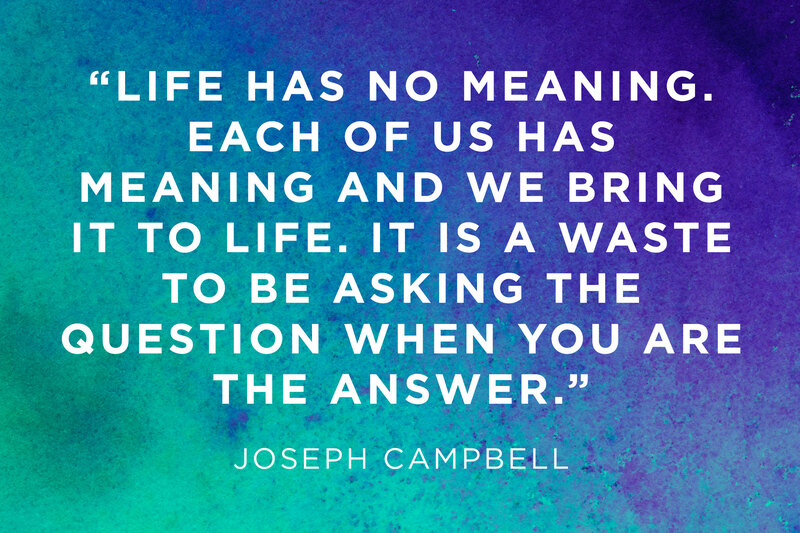 Is it possible to find the meaning of life and be truly happy? If you've ever felt unsatisfied with a job or any other personal or professional situation, you've probably heard that advice to death. However, this advice is not helpful, and it's also misguided. In today's world, the pursuit of happiness is a deeply ingrained concept. We're taught to expect our lives to be fairly happy, and we're encouraged to do whatever it takes to achieve that. But, as everything else in life, happiness isn't so simple. First of all, happiness refers to what you can get from others and your environment. In other words, you're happy when your material and emotional needs are fulfilled. Take Abraham Maslow's Hierarchy of Needs. Outdated or not, it gives us an idea of what people need to be happy and the importance of each of those areas in our lives - from basic biological needs like food and shelter to more elevated needs like self-development and creativity. However, fulfilling our needs doesn't always make us happy. And in many cases, that comes in direct conflict with the happiness we seek. For example, a job that covers our basic needs for food, shelter, and security could be getting in the way of your need for creativity, flexibility, and freedom. On top of that, we tend to think of happiness as static, as something you either have or don't. However, this isn't the case, at all. Instead, happiness is fluid and fleeting. Not necessarily. Instead, to find that happiness, you need to redefine it, first. We can redefine that happiness by making it broader -- it's not just about the nice feeling you get when your needs are met, or when you receive something pleasant from someone else. It's also about what you can give to others, and how giving gives you a purpose and a connection to your community. To psychiatrist Viktor Frankl, giving helps you reaffirm your very humanity. It makes you forget yourself, and give yourself to the person in front of you. Luckily, you don't have to change your entire routine to switch the focus from your own thoughts and needs to someone else's. See every conversation as a chance to connect with a person. So, instead of just waiting for your turn to speak, pay attention to every word the other person is saying. Notice the tone of his voice, his body language. And don't forget to ask questions. Can you knit, make origami figures, or draw? Make something and give it away. Never expect anything in return. Take five minutes to think of what's important for you. What are your values? Is there a cause you'd like to champion? Do you have time or skills to give away to that cause? Make it a purpose to be kind to others every single day. Believe it or not, little acts of kindness have a contagious effect. Compliment someone. Notice if she did something with her hair. Help him with his groceries. Offer to do some extra work to help out a colleague. We all started somewhere. We've all been lost, confused, and tired. However, you have answers and insights that can help out someone starting out his journey. By giving, you're creating connections with those around you. Life stops being just about seeking satisfaction and it takes on a deeper layer of commitment. Life is no longer all about you. It's about creating a positive effect on other people's lives. When you engage in actions that transcend your own search for satisfaction, you make your life meaningful. You become part of a community. You assert your humanity. Moreover, you can be happier and more fulfilled. "Ultimately, man should not ask what the meaning of his life is, but rather he must recognize that it is he who is asked." He recognized that the "meaning of life" is not a ready-made commodity that you can pick off the shelf. You make the meaning by how you live. Download Meaning of Life now and set out on the most important voyage of discovery you will ever make. Oh, Life! What Does It All Mean?